Canon has unveiled its latest SELPHY compact photo printer. The CP810 can produce a postcard-sized print in less than a minute, according to Canon's tests. A dye sublimation printer, the CP810 is capable of producing prints of 148x100mm, 119x89mm and credit card-sized 86x54mm. Based on accelerated tests, these prints are said to last 100 years. The SELPHY CP800 replacement has been designed to be more compact and portable, as well as offering more creative options. It features a range of image layout options, including one that offers a range of standard or customised ID Photo images on a single sheet of paper. An Auto Image Optimizer function is said to increase the quality of the print compared to the original digital image. It can adjust the output based on the scene, adjusting the brightness and contrast automatically. The brightness can also be fine-tuned manually, and there's a Smooth Skin effect that's designed to even out blemishes in portrait shots. As well as being compatible with PictBridge cameras and camcorders, photos can be printed directly from memory cards, USB flash sticks or from mobile phones, via the built-in USB port. The CP810 features a tilting 2.7-inch colour LCD screen, meaning images can be output without the need for a computer. An optional NB-CP2L battery back enables printing when you're away from a power outlet. 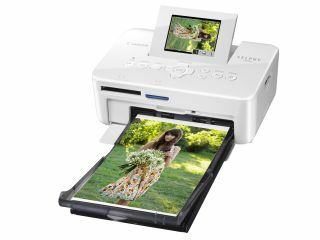 The SELPHY CP810 printer UK price is £99, and it is available from May 2012.